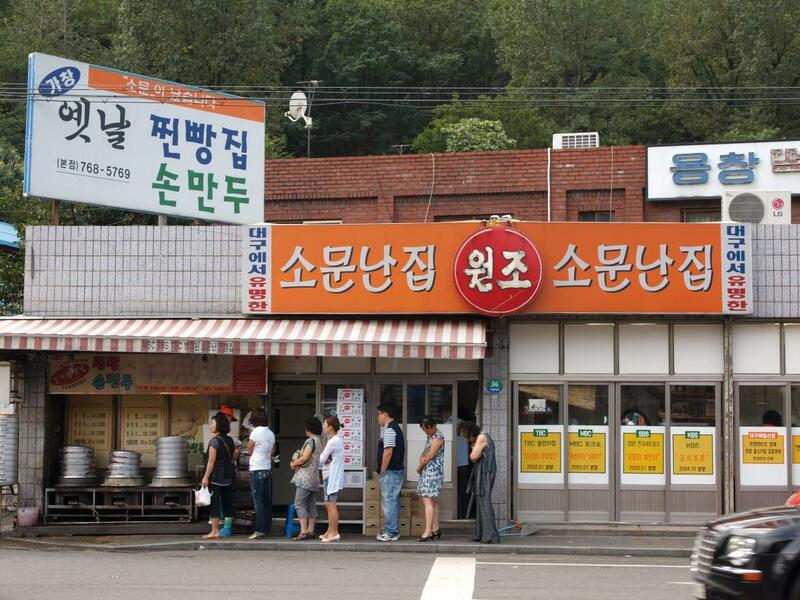 Located in Dong-gu’s Sincheon-dong (Songla-ro) area and having been introduced in a gastronomy pamphlet in 2014 as a “delicious noodle restaurant,” Gohyangjip Kalguksu is a kalguksu restaurant that has been run by members of the same family for three generations. It also operates the conjoined barbeque meat restaurant (Jaebau Cham Sutbul) on the first floor, which serves Korean beef and pork. 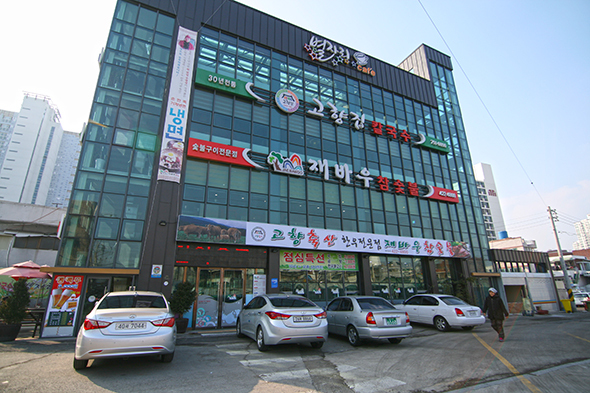 If you head toward Sincheon Station intersection from Sinam Underpass, you will see the restaurant near Exit 1 of Sincheon Station. The large size of the building and clearly-labeled signboard make it easy to spot, and those who come by car will be happy to find that there is a large parking lot next to the restaurant building. The restaurant occupies the second and third floors of a four-story building. The second floor features small private rooms and short-legged tables for sitting on the floor, while the third floor consists entirely of reservation-only seating. The restaurant also has a large banquet hall that can accommodate up to 100 people. The most popular item on the menu is kalguksu. 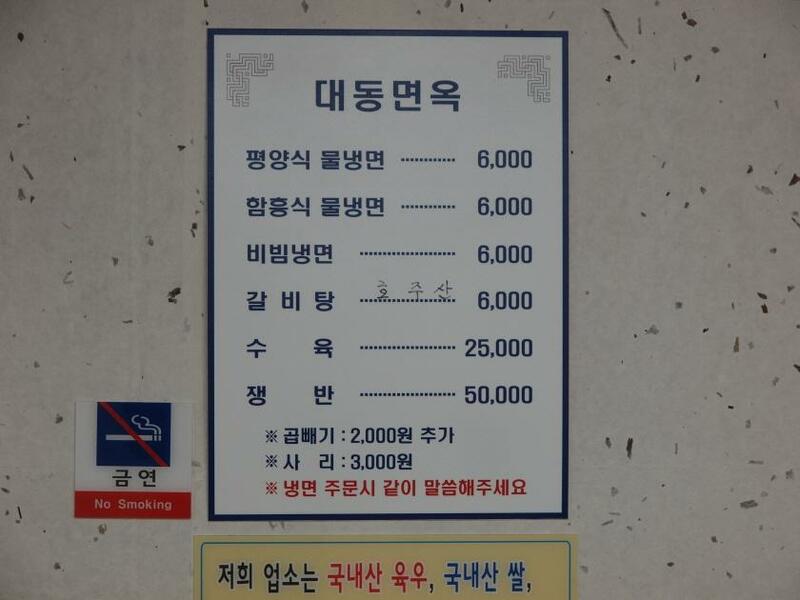 Other delicacies served here include chapssal sujebi, chapssal sundae, ambbong, and suyuk. 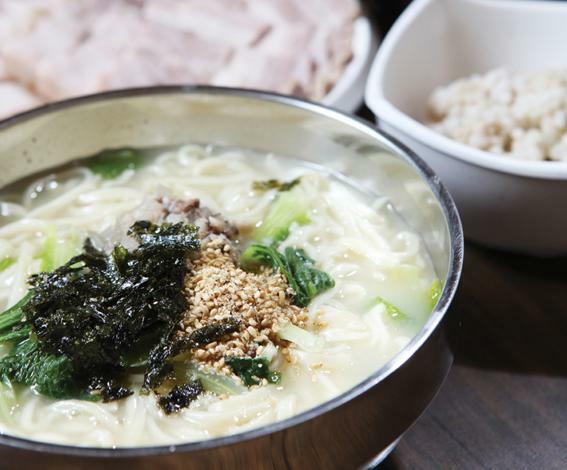 Having been in business for 31 years, the restaurant insists on making its kalguksu using traditional, home-cooking methods, including rolling out the dough for the noodles with a traditional wooden roller. The broth is made with a diverse combination of 12 ingredients, including red crab, anchovy, and dried kelp, and is boiled for over four hours. Due to such dedication and attention to detail, the broth has a deep, rich flavor, and the noodles are wonderfully firm and chewy. Another unique characteristic of this restaurant is that it tops its kalguksu with stir-fried beef. 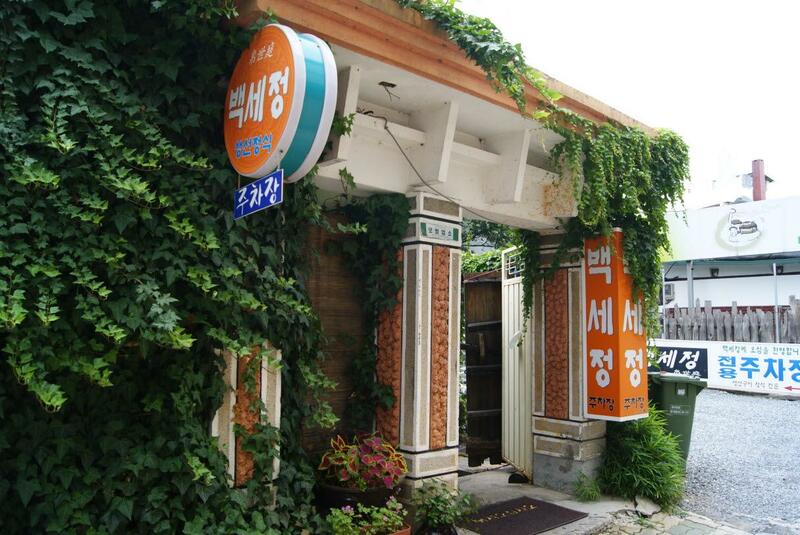 The owner started the business in 1970 in Chilseong-dong, the current restaurant is the 2nd business in Daegu. The cook keeps the principle of “try our best to cook the delicacies with the best food materials” to present the soybean milk cold noodles. It’s a popular restaurant initiated 20 years ago with lots of regular fans waiting for its delicacies for a long time every day. The chewy sliced noodles accompanied with the rich soup and cooked pork impress the regulars again and again. The owner inherits and develops the “Korean traditional delicacy” to lead the domestic cuisine with reliable dishes like steamed bun and dumplings. The documentary freelancer PDD couple had their Indian restaurant opened along with Indian cuisine, Indian culture as well as Indian travel information delivered. 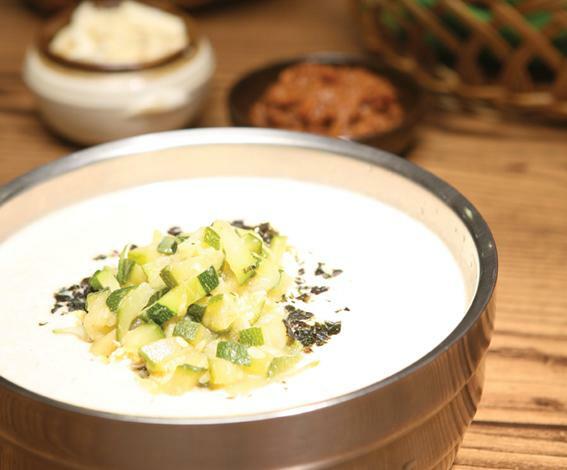 You can taste the enjoyable Indian cuisine rivaled Seoul advanced Indian restaurants in Daegu at a cost-effective price. The renowned traditional restaurant with the longest history of 50 years, offering different sorts of traditional cold noodles, ribs soup and cooked meat. The main course of lite rice noodles along with sorts of yummy delicacies and its particular ambience will absolutely make you another regular of this restaurant. Its convenient location is a good dining restaurant for you to enjoy after visiting the urban city. Surrounded by the pine woods, among which the restaurant seems to be a blossoming flower! 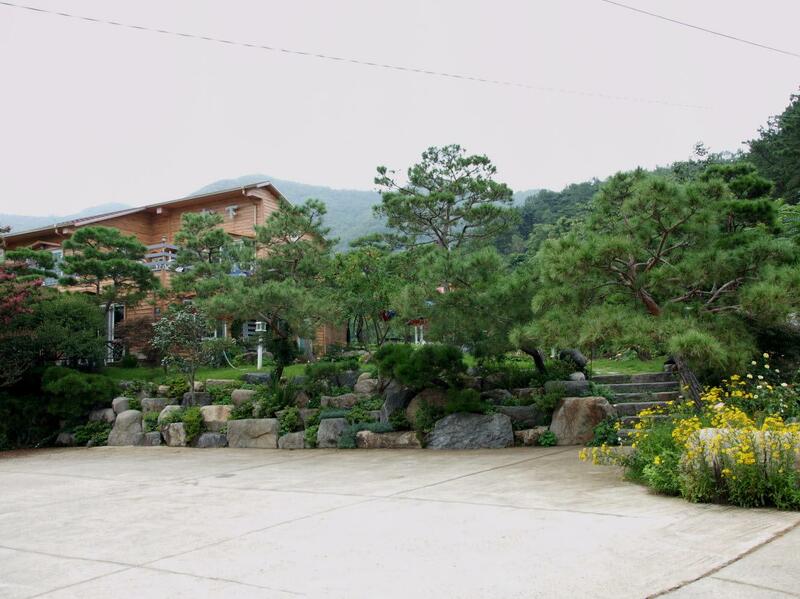 The teahouse is decorated with natural environment-friendly log surrounded by the beautiful landscape, when entering into the teahouse, you mistake it for the villa prepared for you, warm and decent. The traditional tea is made by the owner herself, ideal for the enjoyment with families and lovers. The famous tea with 5 tastes of acid, sweet, bitter, salty and spicy are Schisandra chinensis presenting a gorgeous color, reluctant to drink it. The sticky rice dough pieces soup and ddeokguk (rice cake soup) can’t be more delicious when you are hungry. The owner changed his residence into a restaurant with the parterre full of wild flowers, offering fresh and delicious grilled fish meals to restaurant goers. Except for salt, there’s no artificial flavoring in the kitchen because the 2 cooks are both from the countryside. 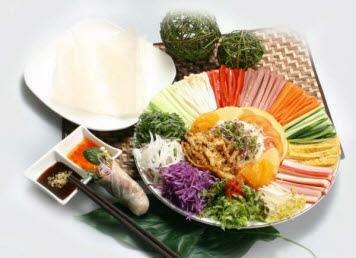 The most famous delicacies are braised mackerel with kimchi and seafood set meal. You are suggested to make a reservation in advance when coming for a visit from other areas because sometimes you need to wait for the table at noon. Drinking a bit of soju during your meal goes well with the dishes is another enjoyment.